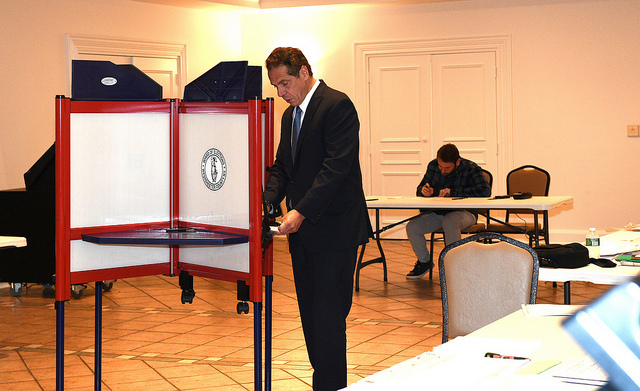 In 2018, New York will be home to elections for statewide seats including Governor, Lieutenant Governor, Attorney General, and Comptroller, as well as one of its two United States Senate seats. In all five positions but Attorney General, incumbent Democrats are seeking reelection. In three -- Governor, Lieutenant Governor, and Attorney General -- there are competitive primaries that will be decided Thursday September 13. New York is also home this year to elections for all of its 27 seats in The House of Representatives -- races that will help determine which political party controls the chamber -- and in the state Legislature, with its 63 state Senate seats and 150 Assembly seats. The state Senate races will determine which party controls the chamber, which Republicans currently lead by a slight margin due to the defection of rogue Democrats. The Assembly is certain to remain solidly in Democratic hands. On Wednesday, July 18, the Max & Murphy podcast moved to the airwaves of WBAI radio, 99.5FM and wbai.org, where the hosts will weekly interview guests, discuss key issues, and take calls from listeners -- every Wednesday 5-6 p.m. The first show focused on the Democratic primary for Attorney General, with guest Letitia James, the New York City Public Advocate now seeking to become the AG. James joined the show to discuss her candidacy, how she stands out from her competition -- Zephyr Teachout, Leecia Eve, and Rep. Sean Patrick Maloney -- her relationship with Governor Andrew Cuomo, how she would fight public corruption, and much more. James also took a couple of listener calls. The show additionally included discussion of the race by the hosts, a short clip of last week's conversation with Teachout, and a couple of other listener calls for the hosts. Listen to the full conversation and let us know what you think -- we're on Twitter @TweetBenMax and @JarrettMurphy. You can listen to the show through the embedded audio below or download the episode wherever you get your podcasts, under "Max & Murphy," and listen to the show on Wednesdays at 5 p.m. on WBAI radio. Governor Andrew Cuomo, the two-term incumbent Democrat who is running for reelection, continues to maintain an overwhelming funding advantage with more than $31 million in his campaign coffers. Cuomo raised more than $6 million since January and spent about $5.3 million in the same period. 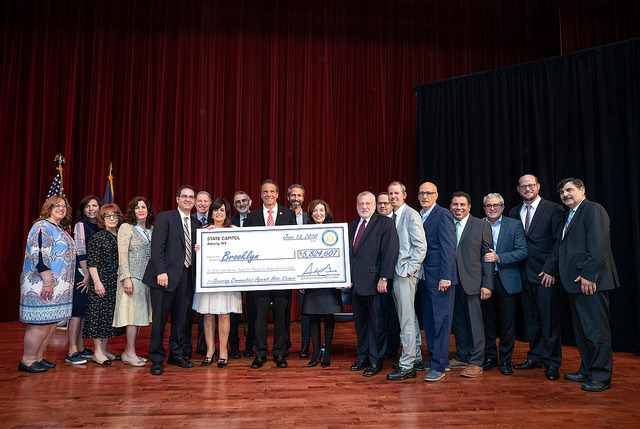 Cuomo’s campaign attempted to tout the number of small-dollar donations it received, likely a response to criticism of the governor’s reliance on wealthy donors and contributions from Limited Liability Companies (LLCs). The campaign said 57 percent of the number of donations received were for less than $250. But those donations only added up to less than $64,000, eliding the fact that nearly 99 percent of the total value of the fundraising came from big donors, including $500,000 in corporate donations and $2.5 million from LLCs and PACs. Cuomo also received 69 separate contributions from the same individual, Christopher Kim of Long Island City, which his primary opponent Cynthia Nixon, the actor and education activist, called an attempt to “astroturf” his campaign (New York Times reporter Shane Goldmacher found that Kim shares an address with a Cuomo aide; several other Cuomo aides, relatives of aides, and long-time associates gave Cuomo small donations in an apparent attempt to inflate his small-dollar numbers). Nixon, who has staked her campaign on small donors, has been issuing scathing critiques of Cuomo’s fundraising practices that she says are a symptom and cause of a pay-to-play culture in state government. Nixon brought in about $500,000 in the last six months, paling in comparison with Cuomo’s haul, and spent about $274,000. Her campaign has noted that she received more than 30,000 individual contributions since she launched her campaign, and that 97 percent of those were small-dollar contributions. She has just under $658,000 in cash-on-hand. Marc Molinaro, the Republican nominee for governor who doesn’t have a primary challenger, raised more than $1.1 million and has spent $250,000, leaving him with $887,000 with four months to go until the November 7 Election Day. Molinaro’s general election competition will become more clear after the Democratic primary is settled, but there are several smaller party and independent candidates running. His running-mate, Julie Killian, does not appear to have filed her discloure yet, but Molinaro's campaign filing shows a $45,000 loan from Killian herself, as reported by Nick Reisman of Spectrum News. Green Party nominee Howie Hawkins brought in $24,000 and spent $7,000 in the filing period, leaving him just under $17,000 in his campaign account. Former Democratic Syracuse Mayor Stephanie Miner, who only jumped into the governor’s race last month and is running as an independent, and her running mate Republican Michael Volpe, the mayor of Pelham, together raised $409,000, spent $247,000 and have $162,000 in cash on hand. The two plan a general election ticket on the Serve America Movement ballot line, for which they are petitioning with the help of the organizers of the new movement. Libertarian gubernatorial candidate Larry Sharpe, who, like Miner, is petitioning his way onto the general election ballot, has raised $115,000, but his expenditures amounted to $154,000, leaving him with a negative balance of just above $13,000. Lieutenant Governor Kathy Hochul, a Democrat seeking a second term alongside Cuomo, faces New York City Council Member Jumaane Williams in the primary, which will be Thursday, September 13. Hochul reported an intake of $1.25 million and had only spent $150,000 in the same time. She has about $1.24 million at her disposal. Williams’ fundraising report was delayed in being published to the Board of Elections website, something the campaign said was over "technical issues" and Hochul criticized him for. "Our campaign's financial disclosure report was filed on time Monday evening but there were technical issues that we are working with the Board of Elections to immediately address," said William Gerlich, a spokesperson for Williams' campaign, in a Tuesday statement. Gerlich said Williams had raised nearly $200,000. When the report was finally published, it showed Williams having raised $183,469.62 and spending $137,967.13, to leave a balance of $45,502.49. However, the campaign appeared to take in several corporate contributions over the limit, and a subsequent need to refund several thousand dollars. Candidates for governor and lieutenant governor run separately in a primary and on a joint ticket in the general. Four candidates are competing for the Democratic nomination for attorney general, in a spirited race that has seen several of them posting strong fundraising numbers. New York City Public Advocate Letitia James was chosen as the Democratic Party’s designee at its state convention. Before her disclosure was posted to the BOE website, her campaign claimed it had raised more than $1.1 million in just two months, and nearly 60 percent of the contributors gave $200 or less. According to the actual filing, James raised exactly $1,165,897.55 and spent $174,417.04, leaving her campaign $991,480.51 in the bank. Zephyr Teachout, the Fordham Law professor who unsuccessfully challenged Governor Cuomo in the 2014 Democratic primary, is running for attorney general, pledging to refuse corporate, LLC, and PAC donations. Teachout showed about $551,000 in fundraising from more than 10,000 individual donors -- 97 percent of her funds came from donors who gave less than $200 -- and has spent about $284,000. She has $314,000 in cash on hand. Former Cuomo and Hillary Clinton aide Leecia Eve raised $300,000 in total for her bid for attorney general and spent about $50,000. Rep. Sean Patrick Maloney reported a $1.1 million haul and spent $145,000, but his campaign told The New York Times last week that he has another $3.1 million in funds raised for his congressional reelection that he believes he can use in the statewide race. He is running for both offices simultaneously, with the state AG primary set to determine whether he stays on the November ballot for congressional reelection. The latest filings also revealed that former Attorney General Eric Schneiderman, who resigned after facing accusations of physical abuse by several romantic partners, triggering the Democratic primary, returned $982,000 to campaign contributors. He still has several million dollars in the bank. Keith Wofford, the Republican nominee for attorney general, raised more than $1 million in total and has only spent about $25,000 since entering the race. He is not facing a primary. State Comptroller Thomas DiNapoli, an incumbent Democrat, isn’t facing a primary opponent this year either. He reported raising $683,000 since January and spent $351,000. He has about $2.6 million in his campaign account, eclipsing his two general election opponents. John Trichter, until recently a registered Democrat, received the Republican Party’s nomination for comptroller. Trichter has only raised $156,000 and spent $18,500. He has about $138,000 in his campaign chest. The Green Party’s Mark Dunlea is also running for comptroller and has $5,000 in campaign cash. Note: This article has been updated with comment from a spokesperson for Jumaane Williams' campaign and additional information. As the September primary and November general ballots begin to take shape, all eyes are on the State Democratic Committee, which will host its convention at Hofstra University on Long Island on Wednesday and Thursday, kicking off with a keynote speech from former U.S. Senator from New York, Secretary of State, and Democratic presidential candidate Hillary Clinton. Democrats from across the state, including more than 300 state committee members, will gather to vote on their preferred nominees and on various proposed resolutions and party rule changes. There’s little doubt that Governor Andrew Cuomo, who is running for a third term, and his running mate, Lieutenant Governor Kathy Hochul, who is seeking a second term, will be chosen as the state party’s nominees at the convention. Though both are being challenged from within the party, their nominations seem a foregone conclusion, according to a leaked convention agenda first reported by NY1’s Zack Fink. The key question, though, is how much support Cuomo and Hochul will each earn from their party members. Cuomo is being challenged in the primary by actor and activist Cynthia Nixon, who won the nomination of the Working Families Party over the weekend and is guaranteed a spot on the general election ballot if she and the party decide to keep her there. As per the Democratic Party’s bylaws, a candidate will have to receive 50 percent of the weighted vote of committee members at the convention to win the primary nomination. 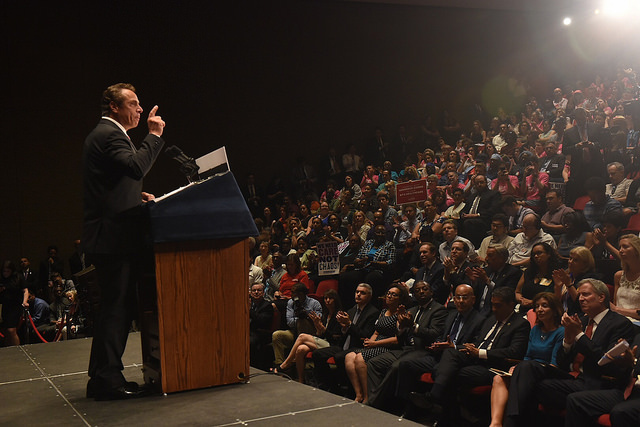 Cuomo controls the state party apparatus and has enough support to be guaranteed the nomination. He’s also set to be endorsed by Clinton, who handily won New York in her failed bid for the presidency in 2016. While governor and lieutenant governor candidates compete separately in the party primaries, they become a ticket for the general election. Incumbent Comptroller Tom DiNapoli does not have any challengers and is expected to be nominated again without controversy. On the other end of the spectrum, the recent resignation of Attorney General Eric Schneiderman, following allegations of physical abuse by four women, has led to a small scrum of Democrats vying for the open seat. The presumed frontrunner is New York City Public Advocate Letitia James, who rejected the WFP’s likely nomination over the weekend to focus on the Democratic convention (and perhaps to side with Cuomo, who had a dramatic falling out with the WFP, and key labor unions who chose Cuomo over the WFP). Fordham Law professor Zephyr Teachout, who challenged Cuomo in the 2014 gubernatorial Democratic primary, is also seeking the Democratic nomination for attorney general, though she has not officially declared her candidacy. The WFP chose a placeholder for their ballot line and expressed support for both James and Teachout and is expected to back whoever prevails in the Democratic primary. It’s not clear what kind of support Nixon, Williams, and Teachout will receive at the convention. All are popular with the left wing of the Democratic Party, but may not have sway over that many state committee members. “I feel that it’s going to be a coronation of Andrew Cuomo, you know, pre-orchestrated,” said Jay Bellanca, a state committee member from upstate and co-chair of the New York Progressive Action Network. New York State Democratic Party Executive Director Geoff Berman said in a phone interview that the nominations are not decided until the votes are complete. He refuted any suggestion that the convention was a formality, as some critics have said. “We run an open, fair process,” he insisted. “The state committee is still...very opaque, even to members and still has the feeling of an insiders club,” said Ben Yee, a state committee member. “I’m not 100 percent sure that Cynthia and Jumaane will get the 25 percent required to not petition, but I do feel confident that a contingent of state committee members will vote for them,” Yee added. He said there’s a “good chance” they’ll each get the 25 percent. At each convention, the state committee votes on various resolutions advanced by members and on potential changes to its bylaws. The agenda revealed by NY1 showed proposals that were both humdrum and controversial, some of which were known beforehand. A prominent rule change introduced by NYPAN’s Bellanca and supported by progressive activists would allow as many as 2.6 million voters unaffiliated with any political party to cast their ballots in the Democratic primary. The change could significantly affect election results though it’s unclear if it can pass the convention since it would require a two-thirds majority of state committee members. Bellanca pointed to the leaked agenda, in which the resolution was already listed under “tabled,” as proof that the results are predetermined. “I’m expecting it to be somewhat ridiculous,” he said, assuming that that resolution and others that would reform the party are “probably” dead. “I think they’re going to try and kill them,” he said. Two resolutions were targeted at rogue state Senator Simcha Felder from Brooklyn. Felder is a registered Democrat who was reelected in 2016 on the Democratic, Republican and Conservative Party lines. He is a conservative who caucuses with Republicans, giving them a one-seat majority in the state Senate and effectively thwarting any legislation forwarded by the more progressive Democratic conference. The convention’s leaked agenda suggests that certain committee members may seek to kick Felder out of the party, or at least to formally support whoever challenges him in the September primary and devote resources to such a challenger, currently Blake Morris. If Felder is defeated, that alone could flip the state Senate to Democratic control, though there are a number of swing districts around the state that will be at play this fall when the entire Legislature is up for election. The committee is also expected to take up a resolution to financially support Democrats running for state Senate seats and calling for loyalty pledges from former members of the Senate Independent Democratic Conference -- who used to caucus with Republicans and support their hold on the chamber. Cuomo, who tolerated and allegedly encouraged the IDC’s existence for seven years, recently brought the breakaway conference back into the fold and is taking stronger steps to regain Democratic control of the Senate after lackluster efforts to achieve that in the past, leading to criticism from many Democrats, especially more liberal members of the party. Another party resolution would call for the closure of the much-derided LLC loophole in the state’s campaign finance law, which allows untold amounts of money to flow to state electoral candidates from hidden donors. 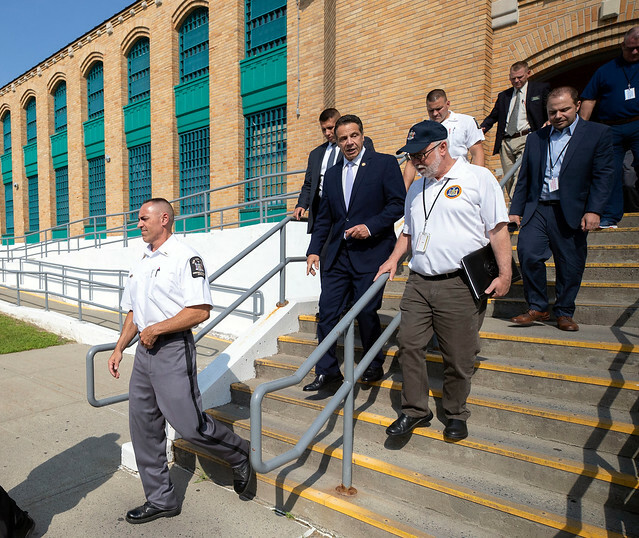 Cuomo has repeatedly called on the Legislature to close that gap in the law, even as he has been its biggest beneficiary and declined to voluntarily turn off the spigot. There are other proposals which have yet to be fleshed out but could make for heated debate, including changes to the process of selecting candidates for special elections; changes to how delegates to the Democratic National Convention are chosen; changes to how the state party’s chair and executive committee are chosen; requiring statewide candidates to submit 10 years of tax returns; and an “outside independent investigator for sexual harassment allegations,” among others. Yee, who serves as secretary for the Manhattan branch of the state party, said that if a resolution calling for more budget transparency from the state committee to its own members fails to pass, it’ll cause consternation among the progressives who are already incensed by what they see as the party’s misuse of funds. Case in point: the party’s massive outlay for a media campaign that seemed to support the governor rather than promote the party’s positions. Yee said the issue was prominent in the last few months but has been subsumed by larger political developments. Party Unity or Party Fealty? 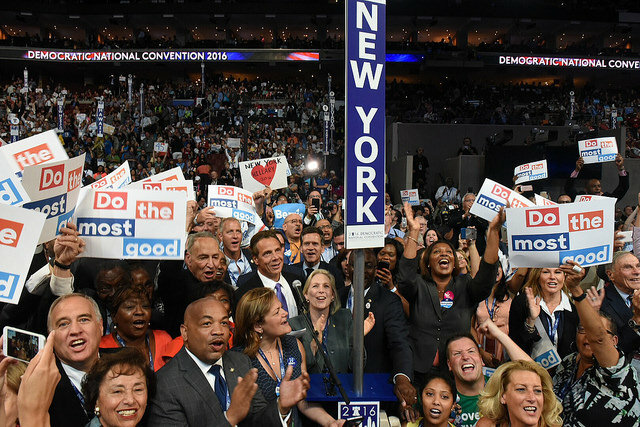 It’s hard to tell whether the Democrats will emerge from the convention as a unified force or as a fractured party. For many progressives, the nominations seem predetermined and the convention a farcical show of party democracy. “It’s very finely tuned and finely orchestrated, but I think there’s going to be a lot more contention than we’ve ever seen before at this convention,” Bellanca said. Cuomo’s strongarm tactics have alienated members like Bellanca, who see the governor’s influence extending through the state party and directed at his opponents. A number of progressive groups including NYPAN, Our Revolution, and Indivisible NY intend on holding a Tuesday presentation at the Marriott Hotel, where convention delegates will be holed up, on the DNC’s Unity Reform Commission report -- issued in the wake of the 2016 presidential election -- to try to convince committee members to support their proposals. Nixon also indicated on Monday that she had invited state committee members to a conference call to discuss her candidacy as she hopes to earn support at the convention. Coads, the Long Island committee member, hoped and prayed for unity, holding up New York as an example to other states. “I’m positive about it and if we don’t, we’ll find a way to unify as we go forward,” she said. Bellanca disagrees. “I think the war’s still going to be going on between the progressive, reform wing and the establishment that wants first class seats on the Titanic,” he said. 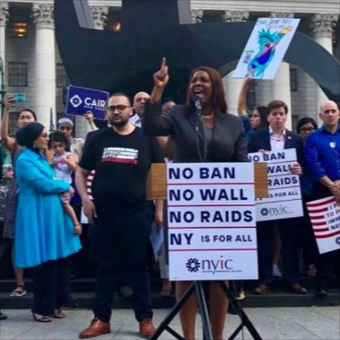 New York City Public Advocate Letitia James officially launched her campaign for attorney general on Wednesday, seeking to make history as the first woman of color to serve as the state’s top legal officer. James, who is serving her second and final term as public advocate, and is the first woman of color elected to a citywide position, is running in the Democratic primary to replace former Attorney General Eric Schneiderman, who resigned last week after facing allegations of physical abuse from four women with whom he was intimately involved. The position is being held in the interim by Barbara Underwood, who was solicitor general under Schneiderman and his predecessor, now-Governor Andrew Cuomo, while the state Legislature is assessing a slate of candidates, including Underwood, from which they will select an appointee to serve the rest of the term. The Democratic primary for attorney general and other state-level positions is September 13. James was seen as the frontrunner for the position even before the Legislature began its selection process, but amid outcry for Underwood to keep the position and against any backroom deals, she declined to seek the appointment and decided instead to only compete in the election. From a dais at the Brooklyn Historical Society on Wednesday, flanked by labor leaders and several members of the New York City Council, where she once served, James spoke of the inspiration she draws from legal stalwarts like Barbara Jordan and Thurgood Marshall, and made the opening pitch her candidacy. “I was taught at Howard University that the law should be an instrument of change,” James said in humble tones, “that the law must be used as a vehicle to right wrongs.” She pledged to defend the state’s most vulnerable communities, touting her past work as a public defender for the Legal Aid Society and an an assistant attorney general, and her current role heading the office of the public advocate, where she has often used litigation to fight for tenant protections, for children with disabilities, and others, waging high-profile legal battles against the de Blasio administration and against predatory landlords. James promised to “never, ever waver in my fight to uphold and defend your basic rights,” vowing to oppose any harmful policies imposed by the federal government. There are no other declared Democratic candidates for the fall election at this time. The state party will hold its nominating convention next week, at which James is expected to at least earn a place on the ballot, if not the party’s official backing. James has a strong base of support in New York City, including from the labor unions that immediately endorsed her and others likely to follow, but she will need to expand her reach outside the five boroughs to win statewide, both in the primary and what is likely to be a more competitive general election than she has ever faced in heavily Democratic New York City. She’ll also need to raise a significant sum of money quickly, which could be helped if she wins the backing of Cuomo, a prodigious fundraiser with deep ties to wealthy donors and seeking a third term this fall. Although James said in her speech that she tends “not to be about politics,” the politics of the race were nonetheless inescapable. The New York Times reported earlier this week that James was telling supporters that Governor Andrew Cuomo and his allies were pushing her to refuse the nomination of the Working Families Party, a prominent smaller political party with a progressive base, or risk losing his support. The governor, who is known for his strong-arm tactics and has clashed with the WFP, which is backing his primary challenger, Cynthia Nixon, denied making the overtures. On Wednesday morning, James’ campaign indicated she will not seek the endorsement of the WFP, saying that she is focused on winning the Democratic nomination, though she has sought and earned both parties’ support in the past (James was first elected to office in 2003 as a City Council member solely on the WFP line). The declaration sparked a rebuke of Cuomo from the WFP. “It is nothing short of outrageous to see Andrew Cuomo demand Tish James jump through hoops that he would never ask a white man to do,” four WFP leaders said in a statement that included further attacks on the governor, who had the WFP’s backing in his 2010 and 2014 gubernatorial campaigns. The Democratic nominating convention will be held next week, while the WFP nominees are expected to be announced this weekend at its own convention. The party is already behind Nixon for governor and City Council Member Jumaane Williams for Lieutenant Governor. It is also backing Comptroller Tom DiNapoli for reelection. Zephyr Teachout, a law professor who unsuccessfully challenged Cuomo in the Democratic primary four years ago, told Gotham Gazette on Wednesday that she is seeking the WFP nomination for attorney general and that she also plans to appear on the Democratic primary ballot for the position, a spot she will either earn through a vote at the convention next week or through collecting enough ballot petition signatures around the state. Teachout, who is not officially running for AG yet, is currently Nixon’s campaign treasurer, an arrangement that may change if she officially declares her candidacy for attorney general. James’ announcement was backed by the forceful endorsements of three labor unions: the New York State Nurses Association, Communications Workers of America Local 1180; and the Retail, Wholesale and Department Store Union. “Tish James listens to every voice and fights for those without a place at the table. She doesn’t preach. She acts,” said Gloria Middleton, president of CWA Local 1180. Former City Council Speaker Melissa Mark-Viverito also showed her support to the public advocate, standing on stage along with current City Council Members Laurie Cumbo, Alicka Ampry-Samuel, Andrew King, Mark Levine, Robert Cornegy, and Justin Brannan. While James is the first to officially jump into the primary race and Teachout appears close, several other possible AG candidates are possible. Democratic State Senator Michael Gianaris has said he’s considering a run, as has Congressional Rep. Sean Patrick Maloney, also a Democrat. Former United States Attorney Preet Bharara has not ruled it out when making public comments. While Bharara is a Democrat, Bloomberg News reported he may run for AG as an independent. The only declared Republican in the race is attorney Manny Alicandro, though others are said to be considering a run given Schneiderman’s resignation. The recent resignation of former Attorney General Eric Schneiderman sent shockwaves through the New York political world, and with just six months until New Yorkers elect a new attorney general in November, it sent potential candidates scrambling. Political party nominations are being decided, ballot spots must be secured, and party primaries are September 13. Soon after Schneiderman’s departure amid accusations that he was physically abusive of four women he had been in romantic relationships with, according to reporting by The New Yorker, several individuals expressed interest in becoming attorney general. One is Zephyr Teachout, the law professor who challenged Governor Andrew Cuomo from the left in the 2014 Democratic gubernatorial primary, who quickly said she was forming an exploratory committee. Among other moves, Teachout sent out e-blasts to her supporters asking if they want her to run and used her Twitter account to discuss her resume and the role of attorney general. Currently the campaign treasurer for Cuomo’s leading 2018 primary opponent, Cynthia Nixon, Teachout even had a logo mocked up for her potential attorney general run. On Wednesday, Teachout told Gotham Gazette that she has submitted her name for consideration by the Working Families Party, which is holding its nominating convention this weekend in Manhattan, and that she will be pursuing enough support at next week’s State Democratic Party convention to secure a ballot line. 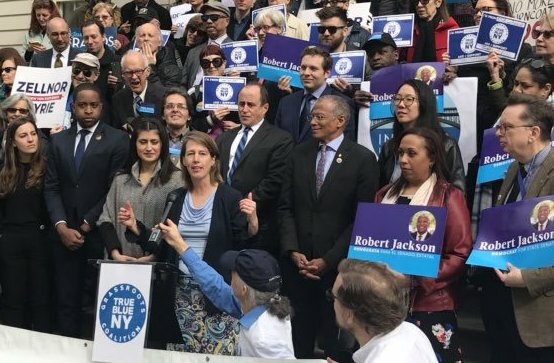 On the same day that New York City Public Advocate Letitia James, a Democrat, formally announced her candidacy for attorney general, Teachout also indicated that she’s prepared to collect enough petition signatures to compete in the Democratic primary if she does not meet the threshold at the party convention. "I'll be making a decision fairly shortly," Teachout told Gotham Gazette about whether she will indeed seek the statewide office that is New York’s chief legal officer. "I'm grateful for the incredible response I've gotten from people I know from different aspects of my work: anti-corruption work, antitrust work, Trump work,” she said. “It's been really wonderful to get this kind of support." "I submitted my name to be considered,” she said of the Working Families Party, which came close to backing her against Cuomo in 2014, but went with the governor after he agreed to a series of policy and political goals that he mostly did not follow through on. “I'm planning to be at the convention on Saturday," she added. It is not clear who else is seeking the WFP nomination for attorney general -- a spokesperson for the party did not respond to an inquiry for the list. "I plan to seek the Democratic Party threshold to get on the ballot, and I'll be at the convention next week,” Teachout also said. “One of the most important things that I think can bring Democrats together is that the next AG can lead the fight against the Trump administration's lawlessness." As Teachout has pointed out, her past and current work is suited toward continuing some of the attorney general office’s most high-profile litigation against the Trump administration, something Schneiderman had made a top priority and is being continued by interim Attorney General Barbara Underwood, formerly solicitor general, who is seeking a legislative appointment to stay in the role through at least Election Day, if not the end of the year, but is not planning to run for election. She touted resume items such as “writing about and fighting corruption my entire career,” working as a death penalty defense lawyer, pushing for stronger antitrust enforcement and prosecution of financial crimes, being “the first national director of the Sunlight Foundation,” and her work as a professor at Fordham Law School. Teachout has received public support from a number of progressives with significant followings or resumes, including Professor Laurence Tribe, and several liberal New York activists. “I have a great exploratory team--Tim Tagaris and Hector Sigala from Bernie's digital juggernaut, BrownMiller Group; ALG Research; Putnam Partners (whose past clients include Barack Obama, Hillary Clinton and Kamala Harris' AG race),” she tweeted. Notably, BrownMiller is the firm that in 2013 “ran the petition drive that placed Eliot Spitzer on the ballot with over 27,000 signatures in just four days,” as its website states of the blitz that got the former governor on the Democratic primary ballot for the city comptroller race. That type of work would come in handy if Teachout needs to go the petition route to make the Democratic primary ballot again the state party nominee, which at this point is likely to be James, and possibly others. The public advocate, whose first win of elected office was on the Working Families Party line in a 2003 City Council race, has indicated that she is not seeking the WFP nomination, apparently siding with Cuomo after the governor’s recent split with the party as it endorsed Nixon for governor after backing Cuomo in his 2010 and 2014 wins. After her campaign kickoff event in Brooklyn on Wednesday, James declined to answer with specificity why she had made that choice, instead repeatedly stating that she is focused on winning the Democratic nomination. She did say that she is independent and not one to be bullied, though she did not explicitly state that Cuomo had not factored into the decision in some way. Four leaders of the WFP put out a statement Wednesday morning accusing Cuomo of essentially forcing James to choose him and the Democratic Party apparatus that he controls over the WFP, even assigning racial and gender components to the alleged arm-twisting. The Cuomo campaign shot back in reciprocal fashion. If Cuomo does support James’ candidacy, she will have significant advantages as she seeks to become the first woman of color elected New York attorney general. 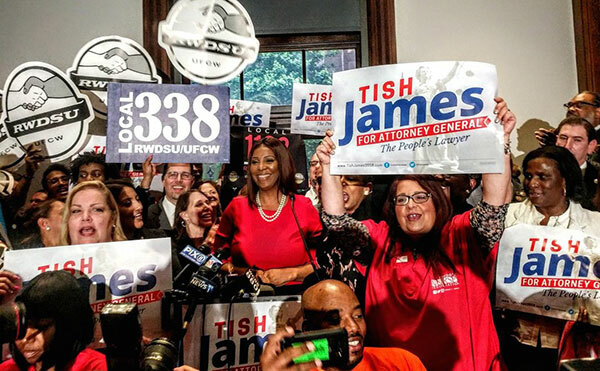 James has a solid base of support in New York City and the likely backing of many labor unions, three of which endorsed her at her launch, but she has never been a strong fund-raiser and is not well-known outside of the city. Teachout, meanwhile, has some degree of name recognition and support outside the city after her 2014 gubernatorial run -- when she won 34 percent of the primary vote against Cuomo, largely by doing well upstate -- and her 2016 congressional run in the Hudson Valley, which she lost to Rep. John Faso, 54-46 percent. As for her role with the Nixon campaign, Teachout did not directly answer on Wednesday whether she would step down as treasurer if she does formally throw her hat in the attorney general race. "I've been very clear about my support for Cynthia Nixon, but if she's governor and I'm attorney general, if there's anything within the AG's purview, even a whiff of corruption, I would pursue it,” Teachout said. “I'm a very independent person." But on Friday morning, Teachout told Gotham Gazette that she will indeed step down as Nixon campaign treasurer as she pursues an attorney general run. Note: this story has been updated with Teachout's decision on Friday to step down from the Nixon campaign as she explores an AG bid. As the office and campaign of Manhattan District Attorney Cy Vance reexamine internal policies regarding the acceptance of campaign contributions, they may want to reference the guidebook of the office of the State Comptroller or Attorney General, both of which have implemented their own donor-vetting systems and guidelines in the wake of controversies involving fundraising practices. These checks far exceed what is required by lax and porous state campaign finance laws. District Attorney Vance, facing immense pressure over his handling of a sexual misconduct case against disgraced producer Harvey Weinstein and of a fraud investigation into Donald Trump, Jr. and Ivanka Trump, announced Sunday in a New York Daily News op-ed that he had enlisted the Center for the Advancement of Public Integrity (CAPI) at Columbia Law School to review and recommend restrictions on his campaign finance practices, especially with regard to contributions from defense lawyers with business before the district attorney’s office. The response to reports that Vance had accepted large campaign contributions from lawyers affiliated with the Trumps and Weinstein, before and after each case was closed, recalls another flare up involving Attorney General Eric Schneiderman, during his $40 million lawsuit against Trump University, which started in 2011 and spanned about six years, though the office does abide by internally enforced campaign finance guidelines. Schneiderman’s office came under scrutiny for his campaign’s acceptance and alleged solicitation of funds from members of the Trump family while engaged in litigation against the university, which was widely seen as a scam. Trump has given $12,500 to help get Schneiderman elected as attorney general, and Ivanka Trump reportedly gave $500 to Schneiderman’s campaign in 2012. Trump aides claimed the mogul was told Schneiderman’s campaign solicited contributions from Ivanka offering to make the “very weak” ongoing investigation “go away,” and filed a complaint with the Joint Commission on Public Ethics (JCOPE), though the ethics advisory organization decided not pursue the case. It would not be not the first time Trump was accused of attempting to buy his way out of the legal mess surrounding Trump University. In 2013, Florida Attorney General Pam Bondi, who was up for reelection, reportedly solicited Trump for donations while acknowledging that she was considering joining Schneiderman in his Trump University suit, but decided not to pursue the case after the mogul made a $25,000 donation to an organization, called And Justice for All, that was backing her campaign. Trump was fined by the Internal Revenue Service, not for the obvious pay-to-play element -- which is legal -- but for making the political contribution from his foundation rather than his personal bank account. Trump settled the Trump University suit, including paying $25 million to individuals who had enrolled in the school, and Schneiderman has continued to pursue cases against Trump, a fact that his representatives cite as evidence that the attorney general is not influenced by donors to his campaign. Even prior to his ongoing battles with Trump, Schneiderman adhered to the policies of his two most recent predecessors by refusing to accept contributions from individuals or entities who have a matter before the office or have had such within the prior 90 days, according to a spokesperson for his office. Furthermore, “every contributor who is personally solicited is subject to an extensive vetting process, and the office has both returned and refused to accept contributions from individuals and attorneys who have had matters before this office,” said Amy Spitalnick, press secretary for the attorney general, in a statement. The policy was tweaked after JCOPE put out an advisory opinion last year expanding this ban to one year for matters in which the attorney general was personally and substantially involved or for contributions that were personally solicited. The ethics advisory commission, which has jurisdiction over state officials and lobbyists, also ruled that directly soliciting and knowingly accepting contributions from the active subject of investigations and enforcement proceedings violates Public Officers Law 74. Other conduct, such as directly soliciting from an attorney that is appearing before the office, would be evaluated on a case-by-case basis, according to JCOPE spokesperson Walter McClure. County-level prosecutors like district attorneys, of which there are 62 across the state, are not under the purview of JCOPE. The city’s Conflict of Interest Board does not deal with conflicts related to campaign finance, and neither the city’s Campaign Finance Board nor the state’s Office of Court Administration, which supervises the conduct of judicial candidates, have power over district attorneys, leaving these law enforcement officials a rare level of latitude and impunity. The massive pay-to-play scandal involving former State Comptroller Alan Hevesi similarly resulted in self-imposed reforms for that office. In 2011, Hevesi -- who had resigned four years earlier as part of a plea bargain for an unrelated scandal -- admitted to accepting $1 million in gifts for himself and friends in exchange for offering "preferential treatment" and $250 million in state pension investments to Markstone Capital, which was owned by Elliott Broidy. Broidy, in turn, gave $500,000 to Hevesi’s reelection campaign. Following his election in 2007, Comptroller Tom DiNapoli enacted a series of reforms, including an executive order and interim policy that banned pay-to-play practices, which went into effect in 2009. The order prohibited the state pension fund from doing business with any investment adviser who made a political contribution to the state comptroller or a candidate for state comptroller, and applied for two years from the date of the contribution. The regulations were put in place ahead of 2010 rules issued by the U.S. Securities and Exchange Commission, which they closely parallel. “The point was to ban the practice without waiting for the SEC rule, which was then in the proposal stage. The SEC rule went into force in 2011, at which point it became the law of the land and superseded or obviated the Comptroller's executive order,” said DiNapoli spokesperson Matthew Sweeney. Recommendations from the CAPI review of Vance’s practices are due in January. Meanwhile, at least two Democratic Assembly members have proposed bills that would significantly curb contributions to district attorneys. One bill was sponsored by Assemblymember Tom Abinanti in February and calls for publicly-financed elections of district attorneys and State Supreme Court justices. It has a handful of co-sponsors, but it never went anywhere. More importantly, Abinanti said, for prosecutors, who are law enforcement officials, publicly-finance elections would enable them to more honestly express their views on issues like drug policy, immigration, and bail reform, at pre-election forums and debates. 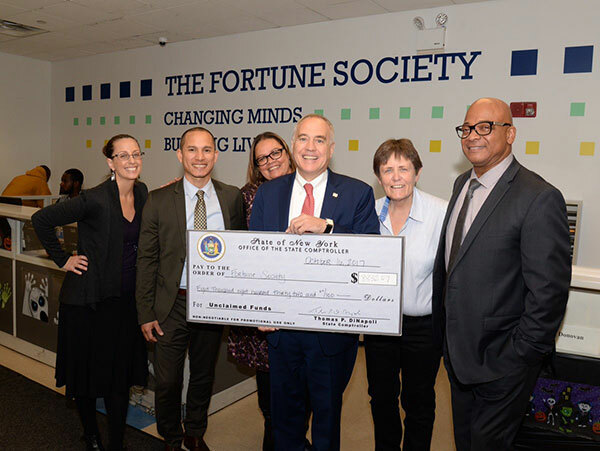 The issue arose in the recent Democratic primary for Brooklyn District Attorney, when Acting District Attorney Eric Gonzalez was criticized for accepting money from the bail bond industry. Another piece of legislation, expected to be introduced in January by Assemblymember Dan Quart of Manhattan, would compile a statewide database of criminal defense attorneys and firms and steeply reduces the amount these individuals and entities can contribute to a district attorney candidate's campaign (up to $320 per election cycle). It also would prevent the bundling of donations to district attorney candidates. “It would create greater transparency and limit the influence of criminal defense attorneys,” said Quart, who noted that the system was based on the “NYC Doing Business” database. Entities listed on the database are greatly restricted by the city’s campaign finance system in what campaign donations they can give to candidates for city offices. Though the New York State Assembly’s Democratic majority conference convened for several hours on Tuesday in Albany, a legislative response to questions raised by the Vance controversy was not discussed, according to Assembly Speaker Carl Heastie. At a packed auditorium at Mount Sinai Hospital Monday afternoon, four of the state’s top elected Democrats united in a show of force to rally against a common enemy: the Republican-led U.S. Senate’s bill to repeal and replace the Affordable Care Act, more commonly known as Obamacare. Governor Andrew Cuomo, Attorney General Eric Schneiderman, State Assembly Speaker Carl Heastie and New York City Mayor Bill de Blasio banded together on Monday, pledging to take legal action should the Senate pass the Better Care Reconciliation Act, the bill that would replace former President Barack Obama’s signature healthcare legislation. The Senate proposal would slash federal Medicaid funding, curtail the program’s expansion, and eliminate tax credits for individuals to purchase insurance on the open market, among other things. “We're going to pay three times more to take care of the people in the emergency rooms than we would have paid if we'd actually given them healthcare,” said Cuomo of the Senate proposal, kicking off the rally. Mayor de Blasio made no mention of the amendment, but instead focused on the unity displayed by elected officials, labor, and business. The mayor himself has repeatedly butted heads with the governor in the past and has seldom been seen at public events with him. The mayor said that the majority of Americans rejected the healthcare bill, and “what's happening in the USA today is spitting in the face of that majority.” On Monday, the mayor urged New Yorkers to spread the message across the country, telling their friends to call their senators. “We all know where those swing votes are,” he said. He echoed the governor, who had raised the spectre of “bankrupt hospitals” and 1.2 million healthcare jobs being jeopardized in the state. “It means 20 percent of the state economy that is healthcare would be devastated if these cuts went through,” Cuomo said.